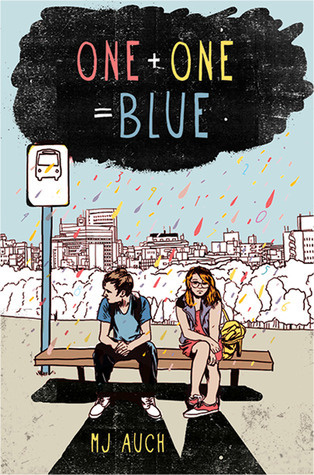 One Plus One Equals Blue was adorable and a little heartbreaking. Basil is a loner, having been homeschooled until he was old enough for middle school, and then not making any friends because everyone else treats him like he's weird. He's used to having no friends, so when Tenzie comes along and immediately starts trying to push her way into his life, things start to get frustrating for Basil. Without giving away too much, we follow Basil as he tries to navigate having this new, outspoken friend who doesn't seem to care about the social conventions and cliques at school. Things get even more difficult whenever Basil's mom, who has been living in California, returns to stay for a while. Basil is conflicted about these changes in his life, and as the saying goes, he needs to "use his words" to do something about it, a task that he struggles with. There are a lot of small lessons in this story about drawing boundaries in your life -- Tenzie is a pushy friend, Basil's mom is pushy, and Basil's grandmother lets it all happen, for one reason or another. I was concerned for a lot of the story with how things were going to end. It would have been really easy for this book to wave its magic wand and make everything all better, but not address any of the issues in Basil's or Tenzie's lives. It addresses some, but not all, of them, and I was pretty pleased with the ending. (I actually skipped ahead to read the last few pages at one point because I was getting really worried that I was going to have issues with the ending.) Everyone learns a lesson, although some of them are more subtle than I would have preferred. I guess it's age-appropriate to keep the lessons less heavy handed, and could make for good discussion afterwards, "why do you think Basil's mom does X" or "why do you think Basil did Y? what would you have done? ", those sorts of things. As a side note, the way that synesthesia is worked into the story is very well done. It's not a defining characteristic for either Basil or Tenzie, but it does inform the way both of them see and interact with the world. Their methods for coping with the synesthesia helps highlight the differences between Basil and Tenzie. It's not a major focal point of the story, though, so if you're looking for a book which solely focuses on this, then this is not it. What an interesting book, I think MacMillan's Henry Holt is doing some really interesting things with books.